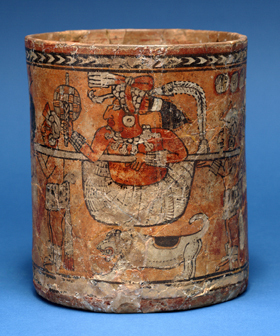 Above, this painted cylinder vessel, circa 8th century CE, was excavated by the Penn Museum at the ancient Maya site of Chama in 1916. Height: 21 cm., diameter: 19 cm. 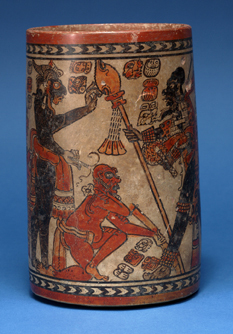 A world-renowned collection of ancient Maya painted pottery, excavated by the University of Pennsylvania Museum nearly a century ago and reinterpreted in light of recent research in the field, provides the centerpiece for Painted Metaphors: Pottery and Politics of the Ancient Maya, a new exhibition now at the Penn Museum. Painted Metaphors runs through January 31, 2010, before beginning a multi-city national tour. The new exhibition at the Penn Museum explores daily life during politically tumultuous times. Like so many pieces of the famous Chama pottery that conservators meticulously put back together at the Penn Museum, Painted Metaphors yields new clues to understanding everyday life—and changing politics—of the ancient Maya of Guatemala 1,300 years ago. The exhibition includes a rare focus on the ordinary Maya, with material that reflects the ancient way of life—more than 150 ancient artifacts, including figurines, jade carvings, musical instruments, weaving implements, burial urns, cave offerings, and more. Additionally, the exhibition features photos and video of Maya life in the village of Chama today. Maya civilization is one of the great ancient civilizations of the world. At its height, it was a densely populated, culturally dynamic society, with cities throughout the region that is now Mexico, Belize, Guatemala, and Honduras. Renowned for their once enigmatic written language (the most fully developed known written language of the pre-Columbian Americas), the Maya developed complex art and architecture, as well as mathematical and astronomical systems. Maya civilization began in the Preclassic period (circa 1500 BCE), reached its height during the Classic period (circa 250 to 900 CE, at the time the Chama pots were created), and continued throughout the Postclassic period, until the arrival of the Spanish in Yucatan in 1512. After the arrival of the Spanish, Maya civilization collapsed, though Maya culture continued and its traditions are practiced today by more than four million descendants in Mexico and Guatemala. Though much has been learned in the last 100 years, much remains a mystery. The history of the ancient Maya continues to be reconstructed, piece by piece, not only by archaeologists in the field, but also by laboratory scientists, epigraphers deciphering ancient inscriptions, and researchers delving into the Museum collections and archives. Through field notes and records, behind-the-scenes conservation video, and more, Painted Metaphors offers a window into the process of reconstruction, and discovery, of the ancient past. Above, known as “The Chama Vase,” from the 8th century CE was found in a stone-lined tomb at the ancient Maya site of Chama (in modern day Guatemala) at the end of the 19th century. Height: 23.5 cm., diameter: 15 cm. The presenting sponsor of Painted Metaphors is Rohm and Haas, celebrating its 100th anniversary in 2009. The media sponsor is The Philadelphia Inquirer, celebrating its 180th anniversary in 2009. Additional funding for Painted Metaphors is generously provided by the Selz Foundation, LLC, the Seth Sprague Charitable Trust, Diane v.S. Levy and Robert M. Levy, WhG’74, Annette Merle-Smith, and A. Bruce and Margaret R. Mainwaring. Painted Metaphors travels on to the Frank H. McClung Museum in Knoxville, Tennessee in fall 2010, and the Hilliard University Art Museum at the University of Louisiana at Lafayette, in winter 2011, with additional venue opportunities available. In addition to the archaeology, there is a lot of laboratory science incorporated in this show, including residue analysis for chocolate in the ancient pots, instrumental neutron activation analysis to determine vessel origins, CT scanning and study of the human skeletal record, and even multispectral imaging of some of the painted pottery scenes. The exhibition includes a world premiere of a documentary on contemporary Maya weavers (presented by the producer), and Maya musical instruments. Penn Museum’s media preview for Painted Metaphors: Pottery and Politics of the Ancient Maya, featured several special guest speakers. 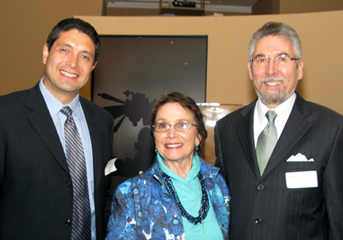 Above, left to right: Luis Fernandez, group vice president and unit business director, Rohm and Haas, presenting sponsor; Dr. Elin Danien, research associate in the American Section of Penn Museum and curator of Painted Metaphors: Pottery and Politics of the Ancient Maya and His Excellency Francisco Villagrán de León, Ambassador, Republic of Guatemala. This new traveling exhibition opened this past weekend and runs through January 31, 2010. On April 28, at 6 p.m., Dr. Danien will lecture at the Museum’s Curator Party for Sustaining Members. Explore the world of chocolate as she relays tales of ancient chocolate from Maya world. In 1998, Dr. Danien completed her PhD dissertation, focused on Penn Museum’s collection of Chama polychrome pottery which forms the core of this new exhibition. Dr. Danien’s recent publications include Maya Folktales from the Alta Verapaz and Guide to the Mesoamerican Gallery, which followed her renovation of that gallery in 2002. She contributed to The Maya Vase Conservation Project, a book written by conservator Lynn A. Grant, about the featured vessels in this exhibition. Events coordinator for the Penn Museum from 1981 to 1989, Dr. Danien founded the Museum’s annual Maya Weekend, an in-depth weekend of exploration featuring Maya scholars, epigraphers and educators, now in its 27th year. A Penn alumna who began her college education at the age of 46, Dr. Danien is founder of Bread Upon the Waters, a Penn scholarship fund that assists non-traditional undergraduates—women age 30 and older—to attain an undergraduate degree through part time study.